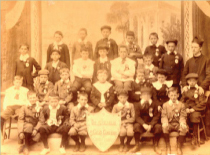 Liam Gogan with his Holy Faith, Glasnevin, National School First Communion Class. 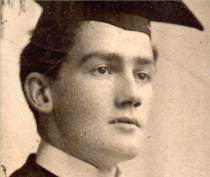 Liam Gogan at his graduation in UCD, 1913. Liam Gogan with his first wife, Máire, outside the National Musuem. Liam Gogan, a young archaeologist, about 1934. Liam S. Gogan was born in 1891, son of a confectionery manufacturer and retailer in Phibsborough, Dublin. Educated in O'Connell's Schools and University College Dublin, he was a pioneer student in the newly founded faculty of Celtic Studies. He graduated in 1913, receiving his MA in 1924. His intense interest in and commitment to the Irish language he attributed to the Gaelic League courses that he took, where his teacher was Sinéad Flanagan, who was later to marry the late President de Valera. In the year following his graduation he was appointed to the staff of the National Museum. Because of his involvement with the Irish Volunteers (Assistant Secretary 1913-15) he was dismissed from the National Museum after the Easter Rising of 1916 and interned in Frongoch in Wales. On his return to Dublin he worked as a teacher with the Gaelic League and as an organizer for the Sinn Féin Party. Following the Treaty in 1922 he was reinstated in his position in Kildare Street. A prolific writer, he contributed regularly both to scholarly reviews and the popular press, as well as publishing other works on Irish archaeology, philology and history. A gifted poet as well, he compiled seven volumes of verse (six of these were published), and which all received favourable critical attention. One piece of verse, Na Coisithe, said to be written on a packing case during a military curfew, became very popular and caught the imagination of Irish students in the middle decades of the 20th century. Always ready to coin a word or aphorism, he claimed also to have originated the now accepted Irish word for republic i.e. poblacht. The compiler of this dictionary collection, Liam S. Gogan, was commissioned in 1950 by the Irish Texts Society to produce a supplement to Dinneen's Irish - English Dictionary, the second and greatly expanded edition of which the ITS had published in 1927. As the century advanced and other sources became available the need to enlarge this collection became obvious to many scholars. Hence the request to Liam Gogan to partly fill this gap. Liam was commissioned to produce this supplement because he had worked very closely as principal assistant to Fr Dinneen. In the introduction to his dictionary Dinneen paid unique tribute to Gogan's scholarship and energy and the huge contribution which he had made to this work. After several years Gogan's collection was twice the size of that originally envisaged, but the Irish Texts Society lacked sufficient funds to continue with its publication. Liam continued working and adding to his collection of words and phrases until his death in 1979. The new standardized spelling was introduced in 1958, followed almost immediately in 1959 by de Bhaldraithe's English-Irish Dictionary. Another landmark work, Niall Ó Dónaill's Irish-English Dictionary was published in 1977, which helped to firmly establish the new spelling which is now widely accepted. The Gaelic typeface has been almost completely replaced by the more adaptable Roman type, although modern technology has made greater variety possible in this area. When Liam died in 1979 there seemed little likelihood of his work getting into print. This work of scholarship should not be lost to the present generation of students of the Irish native language and deserves its rightful place as a monument to a great Irishman and scholar and as a milestone work in the history of Irish lexicography. Happily, digital technology today can dramatically cut the costs of publication and Liam Gogan's work is now made accessible to the public by a working group of relatives and friends, including the writer, formerly an editor of the Royal Irish Academy's Historical Dictionary of Modern Irish (Foclóir na Nua-Ghaeilge) and editor, in hard copy and on line, of a number of Irish Language dialect dictionaries. Liam's death in 1979 undoubtedly left a gap in the ranks of Irish philology and literature. This project of publishing in digital format the expanded supplement (which we now name 'complement') to Dinneen's dictionary, which he compiled over a period of almost 30 years, seeks in part to fill that gap. It is the belief of the production team that, because of the flexibility of digital formatting, it could make even easier and perhaps more interesting reading than the printed page for a younger generation of Irish students. To publish a digital dictionary in this form is ground-breaking original work, and something that can only be done with the aid of modern technology. It gives the student a unique insight into the traditional skills of the lexicographer when material was painstakingly assembled and filed by means of countless cards or paper slips. Over 40,000 such slips are here displayed and made individually accessible. This use of new technology could be used as a prototype to make similar previous unpublished work available to scholars and students which could possibly be used as source material for academic theses. Not all of these slips would have been intended for use in a printed work but the knowledge contained in them would have been condensed and edited down in preparation for the printed dictionary. What is presented here is both a resource and a challenge to the student. There is a choice of using the traditional aspiration (séimhiú) and accent (síneadh fada). The vast majority of citations were extracted from printed sources. A representative sample of the source abbreviations used by Gogan have been identified and verified in order to highlight the authenticity of the material in so far as this is necessary when dealing with a scholar of Gogan's stature. Liam S. Gogan 1891-1979 Biographical Note. I am grateful to Fr Brian Gogan for supplying the biographical information included in this article. See my Introduction for a note on the dictionary collection. Welcome | Browse Dictionary | Search Dictionary | Biography | Background | Credits © Foclóirí LSG Ltd.